Robert Garcia, the trainer for WBA welterweight champion Marcos Maidana (35-3, 31 KO’s), believes Maidana’s going to be soon getting the big $20 million paydays for each fight once he beats Floyd Mayweather Jr. (45-0, 26 KO’s) in their mega fight next month on May 3rd in Las Vegas, Nevada. Garcia sees a win for Maidana not only bringing him to the $20 million stage of his career, but also making him a bigger star than Manny Pacquiao. “If he [Maidana] beats Mayweather, he’ll be huge, bigger than Manny Pacquiao. That’s where the $20 million paydays for Chino [Maidana] come,” Garcia said to esnewsreporting. Maidana was beaming the whole time while listening to Garcia talk about his $20 million paydays in the future. I just hope he isn’t counting on that happening, because the chances of Maidana beating Mayweather are slim. It’s not impossible, because we just saw Maidana pull off a huge upset in defeating little Mayweather, Adrien Broner, last December. But there’s such a huge difference between Mayweather and Broner. You really can’t expect Maidana to be able to do the same things that he did with Broner to a guy like Mayweather. Right off the bat, Mayweather is arguably a lot smarter than Broner, and he’s got much better skills in addition to better experience. Having Maidana get $20 million paydays would be good for Garcia obviously. With him getting a nice cut as the trainer for Maidana, Garcia would end up a wealthy guy at some point if Maidana could get paydays like that for 3-4 years. But it’s just so farfetched right now that it’s just laughable. 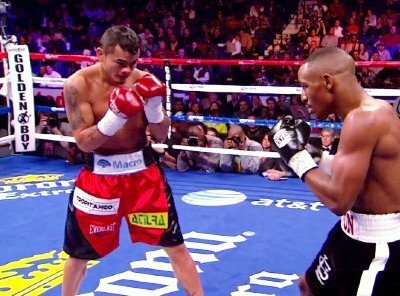 It wasn’t long ago that Maidana was beaten by Devon Alexander and Amir Khan. How can a fighter who lost to those guys be expected to beat Mayweather? Maidana will get a huge payday in a rematch with Mayweather if he beats him on May 3rd, but it’s definitely not going to be in the $20 million range. At best, I’d say maybe $10 million is about the most Maidana could hope for. That’s good money, but a long ways off from the $20 million that Garcia is talking about.